Delicious catering is the centerpiece of any wedding reception. Your guests deserve and expect nothing but the best when it comes to reception hors d’oeuvres, entrees, and desserts, and you’ll definitely want to exceed their expectations. But along the way, you should consider guest who might have special needs when it comes to food. Every wedding is bound to have a few guests with dietary restrictions. Whether they’re vegetarian, gluten-intolerant, or have food allergies, you’ll likely have a handful of guests with special catering needs. But how should you handle those situations? If you’re looking for guidance, don’t worry, because the wedding experts at Platinum Banquet Hall are here to help. Read on for our tips on how to deal with special food requests at your wedding reception. Almost every wedding has at least a handful of vegetarians in attendance, and you should definitely make sure your wedding has some vegetarian dining options. Luckily, accommodating a vegetarian diet is pretty simple. For your entrees, the easiest thing to do is feature a delicious, fresh salad (sans meat!) made with fresh, locally-sourced ingredients. You can also take a similar approach with your hors d’oeuvres, featuring some veggie-centered appetizers perfect for vegetarians. Luckily, a wedding cake won’t be trouble for most vegetarian diners, but it’s always worth double-checking the recipe! Another common hurdle comes in finding gluten-free catering options for your wedding. Many people are gluten-intolerant, or choose not to eat gluten for dietary reasons. But what exactly is gluten in the first place? Gluten is a general term for the proteins found in wheat, rye, barley, and triticale (a cross between wheat and barley). Generally speaking, you’ll find gluten in most common breads, pastas, and baked goods, and gluten-free recipes will avoid those foods or utilize gluten-free alternatives. Luckily, many who are gluten-free stick to an almost “back to basics” diet, heavy in protein like chicken and fresh vegetables. To accommodate gluten-free diets, you need to be sure that your caterer double-checks all the ingredients in their recipes. You can’t anticipate all the food allergies or intolerances of your wedding guests, but you should do your best to accommodate them as soon as possible. Wedding invitations typically ask guests to respond with whether or not they will attend as well as what they’d like to have as their entree, and we recommend including a section allowing guests to list any food allergies or dietary restrictions they have. 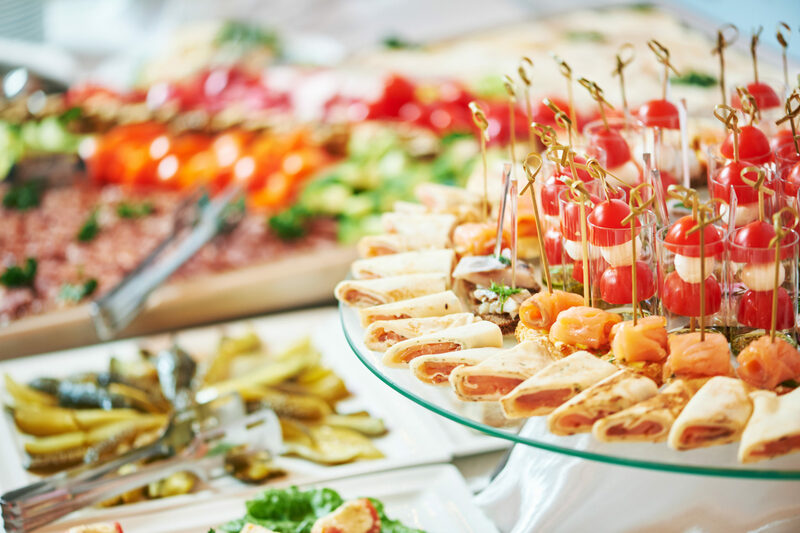 If you know you have a guest with a special food allergy, you can reach out to them to see what they might enjoy as an entree, and ask your wedding caterer to accommodate. It’s also important that you hire a caterer that understands how to cook for people with allergies. Food allergies can be deadly, and you need a caterer who recognizes the severity of the situation and will be extra careful while preparing a meal for someone with an allergy. Don’t Forget The Kids Menu! You’re bound to have at least a few kids in attendance at your wedding, and you definitely need to have some food options for them. Luckily, kids can be pretty easy to please. We recommend featuring some kids’ menu classics like macaroni and cheese, hamburgers, french fries, and pizza, ensuring that your young guests will find something to enjoy. And if you’re looking for a wedding venue in Los Angeles, you should consider Platinum Banquet Hall. Our event venue features lush decor and exceptional accommodations perfect for weddings, anniversary parties, engagement celebrations, and more. We even offer expert catering services able to accommodate any special requests you have. For more info on booking and availability, contact Platinum Banquet Hall today.